Prince Joachim and Princess Marie attended their first official duty together yesterday evening at a reception for the couple at the French Embassy in Copenhagen at the invitation of the French Ambassador Madame Bérengère Quincy. TV2 article 'Marie strålede: Dejligt at være dansker!' - Marie beamed: Lovely to be a Dane! Marie resembled the true princess when she arrived yesterday for a reception at the French Embassy in Copenhagen with her husband Prince Joachim. Dressed in a royal blue, knee-length dress she beamed like the sun, when she gave her charming smile to those who attended and a tense waiting press. When B.T. 's journalist asked Marie how it feels to be Danish, the princess trumped it all by answering a beautiful Danish: "It is lovely, very lovely." 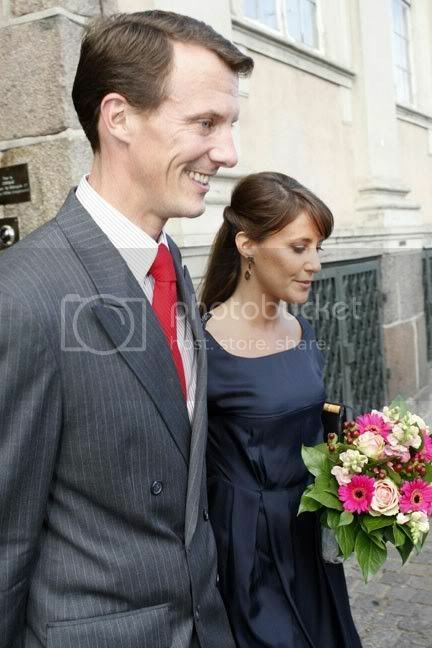 And no doubt Prince Joachim was proud of his beautiful wife. The smile on his face was just as big as his support. 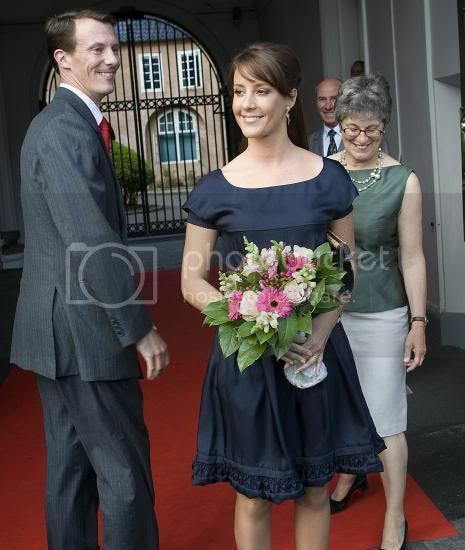 "It's lovely, very lovely," Princess Marie. Language-wise it couldn't have been a better start for Marie since all the conversation at yesterday's arrangement was in French. The arrangement at the French embassy became Marie's début in her life as a royal representative. The début was really to have been last week with The Danish Boys' Choir's appearance in the Odd Fellow's Palæet in Copenhagen, but to everybody's astonishment the princess didn't turn up. She totally took her revenge yesterday. On Friday Marie has to go on her next royal job away from home. This time they go to Berlin, where Joachim and she according to B.T. are guests in connection with the opening of a Danish-German neighbour project. I think that Marie and Mary are both lovely, but one comment for the stylists: please ensure that the ladies are wearing appropriate undergarments to their engagements. Has the slip gone out of style even at court? Nothing is less elegant than a skirt or dress bunching up between the legs. Cheers!